Three Days of Art Workshops, Performances, and More Await You at Pasinaya 2019! To all art enthusiasts, this year's Pasinaya is yet another event to anticipate. 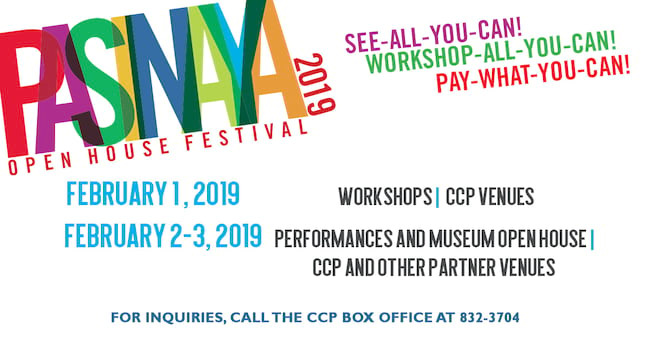 The country's largest multi-arts festival organized by the Cultural Center of the Philippines (CCP) will be held on February 1 to 3, promising three days of workshops, performances, exhibits, street events, museum tours, and film screening at the CCP and other partner locations. The theme for the CCP Open House Festival's 15th year is "Karapatan, Kalayaan, at Kultura" which highlights the basic human rights and freedom and how these two, along with the culture and heritage of the country, help in the development of communities and the building of the nation. What's more exciting is that over 3,000 artists from various fields of art and culture will participate, including fields of music, theater, dance, spoken word, and visual arts. So prepare your senses for three days of artful experience as the Pasinaya is set to transform its venues into the most creative places in the country. On the first day, a donation of P50 will give participants the freedom to attend 30-minute workshops in different CCP venues. Here, one can learn various art disciplines from leading artists and teachers of the art form. Registration will start at 6:30 a.m., at the CCP ramp and Little Theater lobby. The second day will showcase different talents of performing groups from provinces like Bulacan, Quezon, Boracay, Laguna, Cavite, Tarlac, Batangas, Bicol, Rizal, Pangasinan and more. While February 3 will make way for the performances of CCP resident artists: Ballet Philippines, Philippine Ballet Theater, Philippine Madrigal Singers, Philippine Philharmonic Orchestra, Ramon Obusan Folkloric Group, Tanghalang Pilipino, University of Santo Tomas Symphony Orchestra and National Music Competitions for Young Artists. For inquiries, call the CCP Box Office at 832-3704 or visit their website here.